This artist's conception shows the NASA's MAVEN spacecraft orbiting Mars. The mission will launch in late 2013. The U.S. government shutdown could delay the planned November launch of NASA's next mission to Mars — perhaps pushing the flight all the way to 2016, scientists say. The shutdown has frozen launch preparations for the Mars Atmosphere and Volatile Evolution spacecraft, known as Maven, which is slated to blast off Nov. 18 from Florida's Cape Canaveral Air Force Station. Maven has until Dec. 7 to get off the ground, after which point it would have to wait 26 months for another favorable alignment of Earth and Mars. "We're concerned, obviously, but we've got margin in our schedule, and the team is absolutely committed to getting off at this launch opportunity," said Maven principal investigator Bruce Jakosky, of the University of Colorado, Boulder. "If that means working double shifts and working seven days a week, we'll do that." 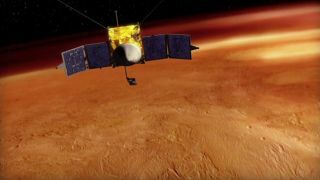 The $650 million Maven mission was designed to help scientists understand how Mars' thin, carbon-dioxide-dominated atmosphere has changed over time. Right now, the probe is sitting in a clean room at NASA's Kennedy Space Center in Florida, awaiting further pre-launch checks and tests. "The team is currently in the process of making sure the hardware is safe, in a stable and known state, so that we don't have to worry about it while it's shut down, and so that we can pick it up when we're turned back on," Jakosky told SPACE.com. Inside the Payload Hazardous Servicing Facility at NASA's Kennedy Space Center in Florida, reporters and photographers look over the Mars Atmosphere and Volatile Evolution, or MAVEN, spacecraft on Sept. 27, 2013. The Mars orbiter is due to launch on Nov. 17, 2013. Jakosky and everyone else on the mission team hope the shutdown — which went into effect at midnight EDT today (Oct. 1) after the Senate and the House of Representatives failed to agree on an emergency spending bill — is resolved quickly. "In some sense, every day is gold, as our project manager has been saying," Jakosky said. "If this goes on for more than a few days, I'll start to get a lot more concerned. I'm concerned now, but I'm not panicked." The shutdown has far-reaching effects across NASA, which has been forced to furlough all but 550 or so of its 18,000 employees and cease most of its operations. The space agency is continuing to protect the health and safety of astronauts aboard the International Space Station, and it's maintaining currently operating scientific spacecraft. But future missions like Maven aren't so lucky. The effect of the shutdown on personal lives shouldn't be lost amid the speculation about possible launch delays and other mission impacts, Jakosky stressed. "People are on furlough; they're not getting paid now. This affects personal lives, families," he said. "If this goes on for very long, people will be hurt by this."